Representatives of the University of the South Pacific Staff Union and Ministry of Employment along with the USP management will meet on Wednesday to discuss and negotiate on salary issues. 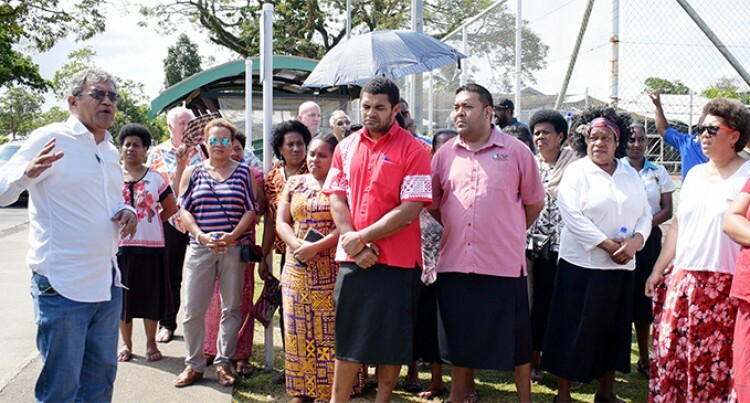 University of South Pacific Staff Union President, Rueban Colata (left) with USP staff as they protested against their pay on August 24, 2018. Photo: Ronald Kumar. This is after members of the USP Staff Union gathered at the USP Tennis Court carpark to plan a march and protest to the Vice Chancellor Rajesh Chandra’s office in regard to their salary. The union president Reuben Colata said the protest was in relation to its members, who did not receive any salary increment since 2013. Two representatives from the Ministry of Employment were also present to address the union members. “Everyone is frustrated by the actions taken by the USP. We will be working with the ministry to negotiate on the issue,” he said. In a media statement the USP said it was aware of the issues being raised by the USP Staff Union on the salary review for members of the Intermediate and Junior as well as hourly paid staff. The university highlighted that there is a USPSU Collective Agreement 2016-2018 with the union which requires the parties to discuss and reach mutual agreement on the issues and concerns raised. The statement also said it was following the law and the HR internal procedures in dealing with issues raised by staff associations. The university also stated that discussions were underway with the USP Staff Union on the issues raised. In this particular case, the university is following the advice of the Ministry of Employment, Productivity & Industrial Relations to address the issues of the association. Mr Colata said as the university worked in the triennium period, since 2013 the members’ last salary increase, the union members did not receive any increment in their pay till to date. “The academic and senior management have received their pay increase in June, 2018, backdated to 2016,” Mr Colata said. “That increase was for the people who are on the salary scale of $50,000 to $300,000. VC was also one of the staff who had received his salary increment. He earns more than $300,000. “The increase that we are asking for is for the people who fall in the category from $10,000 to $33,000. He said the union was not standing up for anything bad; “we are standing for fairness, equality and productivity. “The engine of the university are the staff that are on the $10,000 to $33,000 salary scale,” Mr Colata said. “There are more than 500 staff that are affected and we are voicing out this issue for them. “When we compare our salary and the salary offered by the Fiji National University, they blow us away with the offers they have compared to what we get at USP. “When we negotiate on issues, it is not only the union members who benefit, but everyone that is affected or included. “We have not been treated fairly for years now. “The university’s vision is excellence and to achieve that excellence vision you need everybody together. “Our members have been the backbone of the excellence, but we are not rewarded in the same manner,” Mr Colata added.